The use of mesh to treat gynecologic disorders of pelvic organ prolapse and stress urinary incontinence is widespread. While mesh has provided many women relief of their symptoms and relatively good anatomical outcomes, surgeries employing mesh have had significant complications, resulting in the release of public health notifications, the up-classification of these devices, the discontinuation of mesh products by vendors, and multi-district litigation. 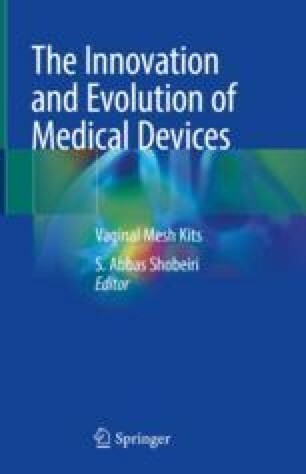 To date the precise etiology of mesh complications is unknown; however, basic science research investigating the pathogenesis of mesh complications has increased over the past 10–15 years, and potential mechanisms have been identified. The purpose of this chapter is to provide an overview of the ex vivo and in vivo studies that have shed light on our understanding of the factors that contribute to mesh complications. Specifically, the impact of mesh textiles properties and mechanics on the host response will be explored. Additionally, this chapter will summarize the pertinent in vivo animal and human studies that have investigated the host response to polypropylene-based mesh. Although biological meshes have also been used in the treatment of gynecologic disorders, polypropylene urogynecologic meshes will be the main focus of this text. Lastly, the chapter will conclude with a future perspective of basic science research on urogynecologic meshes. Barone WR. Mechanical characterization of synthetic mesh for pelvic organ prolapse repair [dissertation]. Pittsburgh: University of Pittsburgh; 2015. http://d-scholarship.pitt.edu/25620/. Accessed 8 Sept 2017.